Pioneer Magnetics, Inc. Modular PFC Product Series can also be used in applications where 400VDC non-isolated single output bulk power converter is required. With PFC, output power can be maintained with a 30% reduction in RMS line current. Other advantages include improved hold-up performance, reduced line harmonics, and insensitivity to voltage and frequency variations. Because they effectively eliminate harmonic currents, the converters are ideal for applications where neutral wire current exceeds recommended ratings due to waveform distortion caused by the typical off-line units. 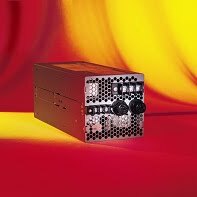 Please contact our power supply sales department for further power supply information.